What is an OF-306 Form? An OF-306 form is an optional form used by the federal government for hiring purposes. Of 306: What Is It? An OF-306 form is an optional form used by the federal government for hiring purposes. This form is also known as a Declaration for Federal Employment. A federal employer may ask a potential employee to fill out this form in order to determine their eligibility for government employment and enrollment in government programs. 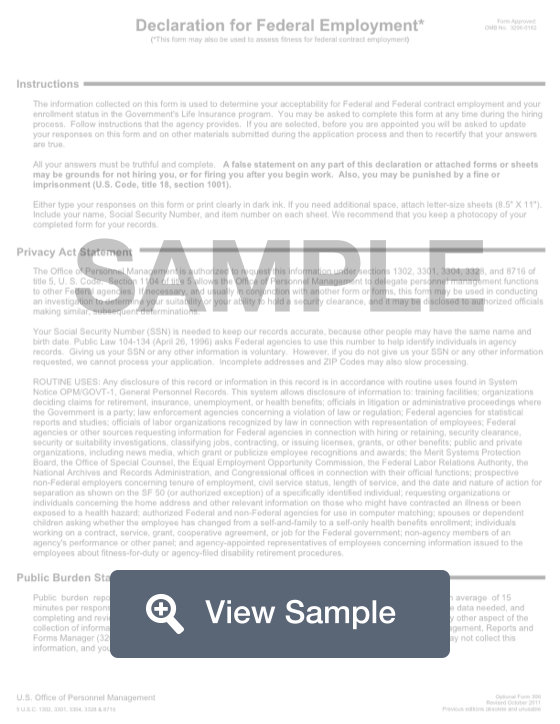 This form will request certain personal information, including full name, social security number, date and place of birth, and prior military service. The form will also ask about your background information, including prior felonies, employment, current debts, and more. All information provided on this form must be truthful. The applicant must sign and date the form in order to acknowledge all the information they provided is accurate and honest. Create a free OF-306 Form in minutes with our professional document builder.